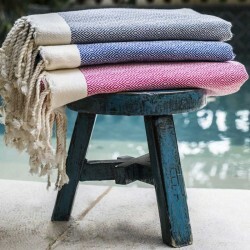 The Fouta was originally used in the hammam ( traditional public bath) as a bath towel and a wrap. 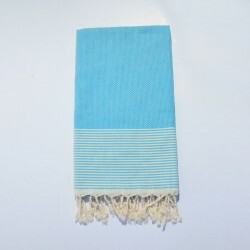 Nowadays, it is used as a beach or pool towel that is fast drying and light in texture. 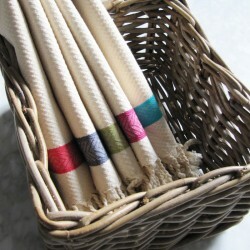 It is also used as a tablecloth, a throw, a gym towel… and of course in the bathroom. The various textures of our Foutas make them particularly water absorbant and a perfect alternative to regular bath towels. They also come in various sizes fit for the body, face and hands. 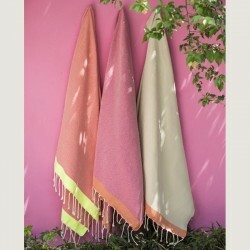 The Foutas also come in a wide range of colors (from light to bright), depending on the season and use. 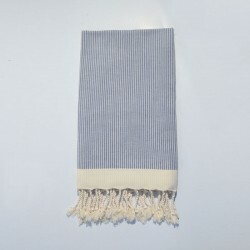 Like all our textiles, the Foutas are woven on antique semi-mechanical looms and not in an industrial way.They are made of 100% cotton with a true selvedge and hand finished fringes. 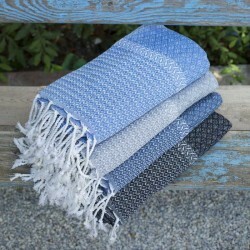 They are practical, versatile and ecological products, and wash more easily than regular towels.